A very warm welcome to Kochi Wanaba, the pencil drawn graphic novel about love, friendship, and how it can all go horrifically wrong. Every monday, wednesday and friday a new page will appear, until the whole book is online in its entirety in early 2011. 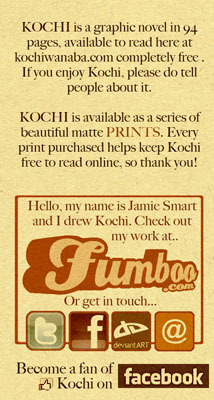 From conception to this website has taken about 6 years, and Kochi’s by no means been easy. In fact at some points I’ve wanted to pretty much destroy it. 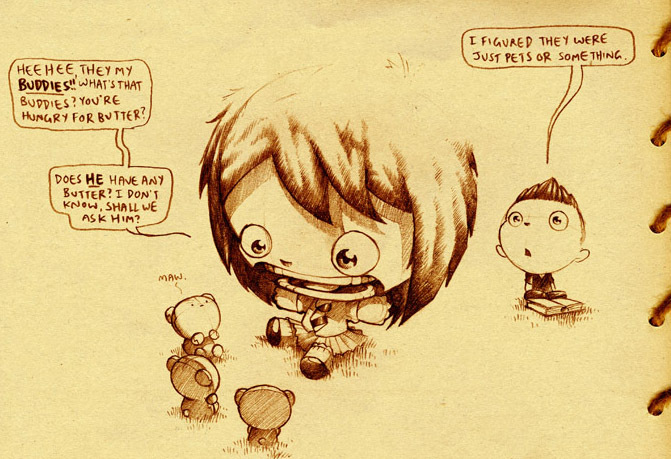 And I would have too, if I hadn’t put so much work into drawing it, and if I didn’t believe in the story so much. This is a tale I’ve been wanting to tell for a long long time, so finally being here, able to share it, is an enormous sense of relief I can’t even explain. So please enjoy it, and help spread the word if you do. High-quality matte prints are available of each page (click the ‘buy this print’ tab at the bottom of the page), and every purchase is REALLY appreciated. Also have a look round the site for extra things, and if you comment on anything without a set avatar of your own, your avatar will come up as a random Kochi character. try it!